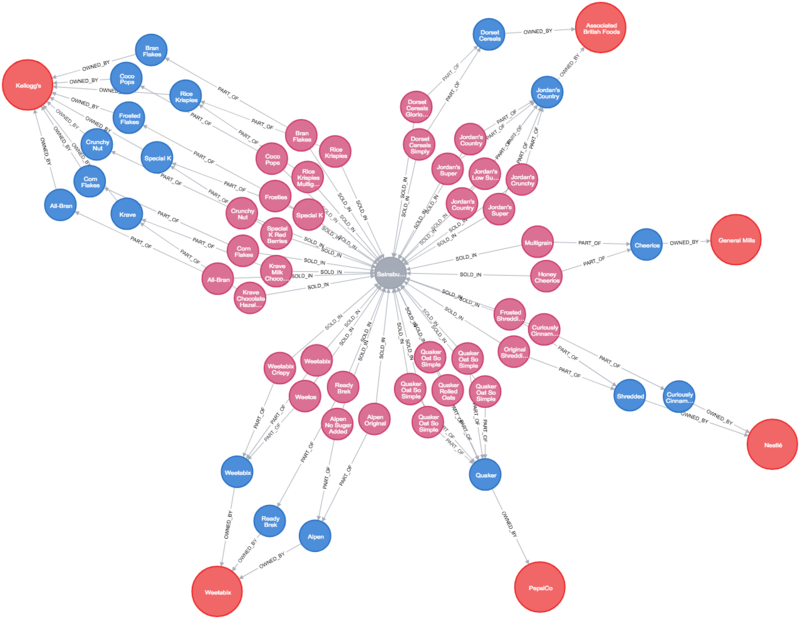 Here at Neo4j, we have a motto: Graphs Are Everywhere. This blog series was inspired by all the times I encountered graphs and “graph problems” in my non-working life. Hopefully these posts help you see more graphs in the world. 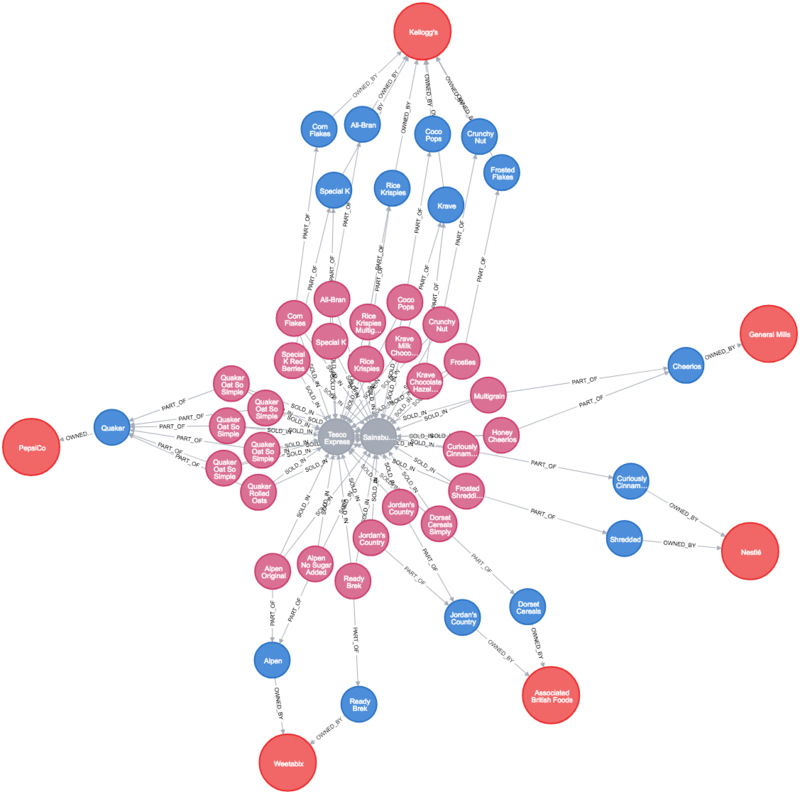 If you’d like to share graphs you find in the wild, leave a post on the Neo4j community site, or send me a tweet (@joedepeau). The gist of the article was that a handful of large companies – about 10 – make up the vast majority of products available for purchase in the average grocery store. You might be standing in the cereal aisle, trying to decide among dozens of options. 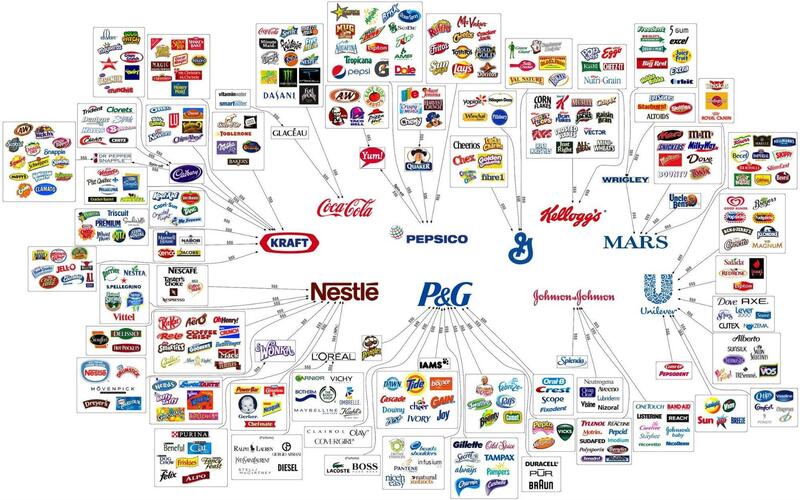 But no matter which cereal you choose, chances are your money ultimately goes to one of a very few companies. What really caught my eye, though, was the infographic that accompanied the article. You know what I thought when I saw that, right? Hey, that’s a graph! 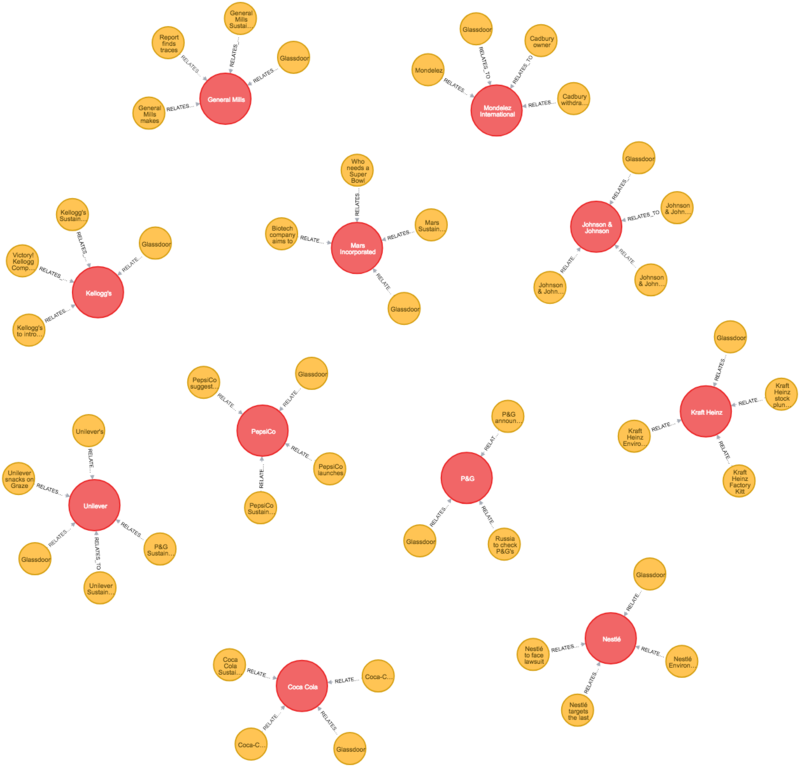 Of course, I figured it’d be interesting to load this information into the Neo4j graph database and see what we might be able to do with it. First, I had to do a bit of research – the above infographic is slightly out of date, and some brands have changed ownership since it was created. I dug around Wikipedia, reviewed the brands list on each company’s website, and found a few more recent infographics. 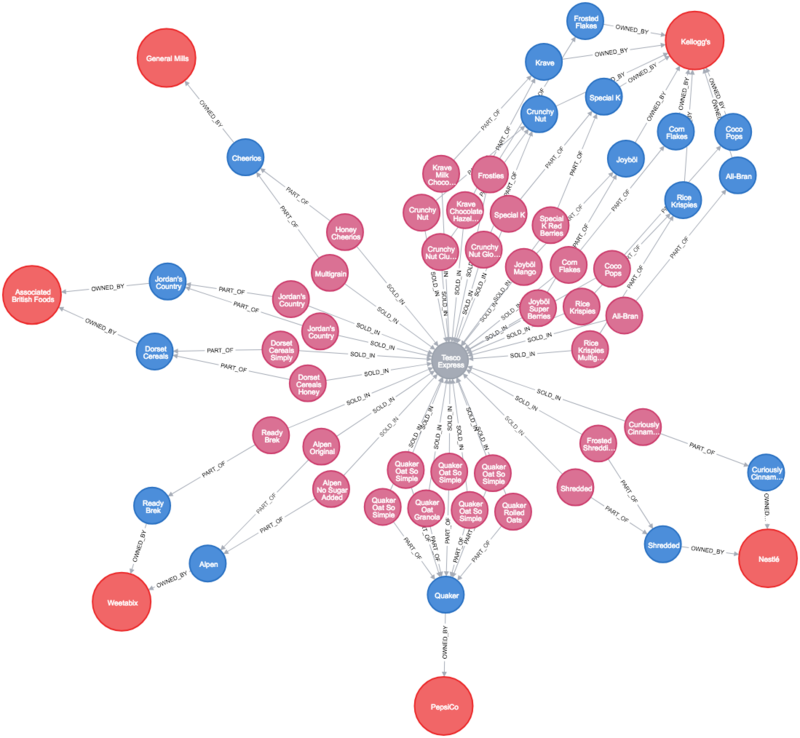 I took all the information I found and fed it into Neo4j. 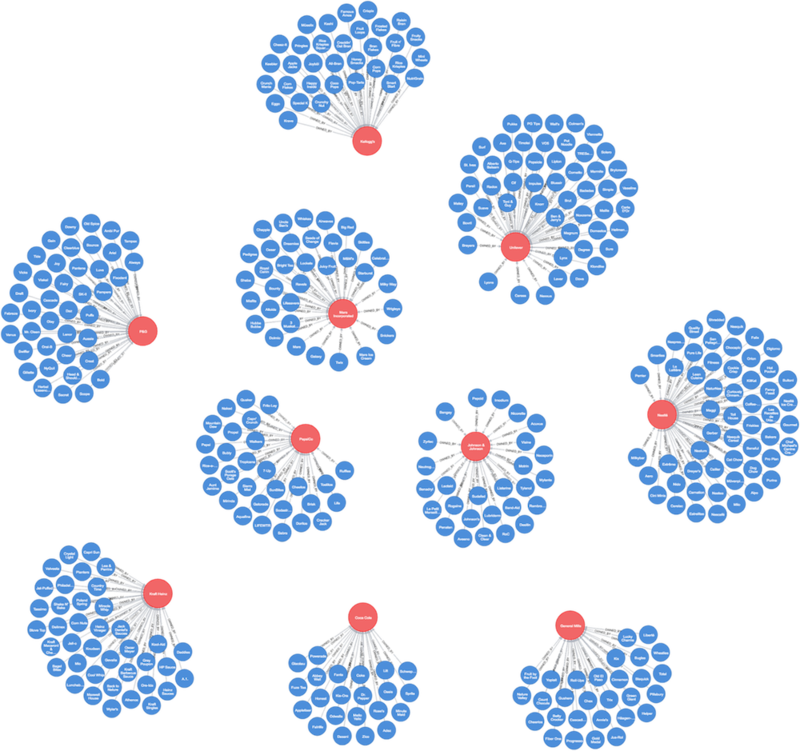 You can see company nodes in red, and their brands in blue. I edited the visualization a little to restrict results to the original 10 companies from the infographic (I’ve added a few more companies, but we’ll come on to that later). That’s a pretty good list of brands, covering a lot of product types: health, beauty, drinks, cereals, pet food, baby care and more. And I could definitely see how much of the food I buy really does come from these 10 companies. 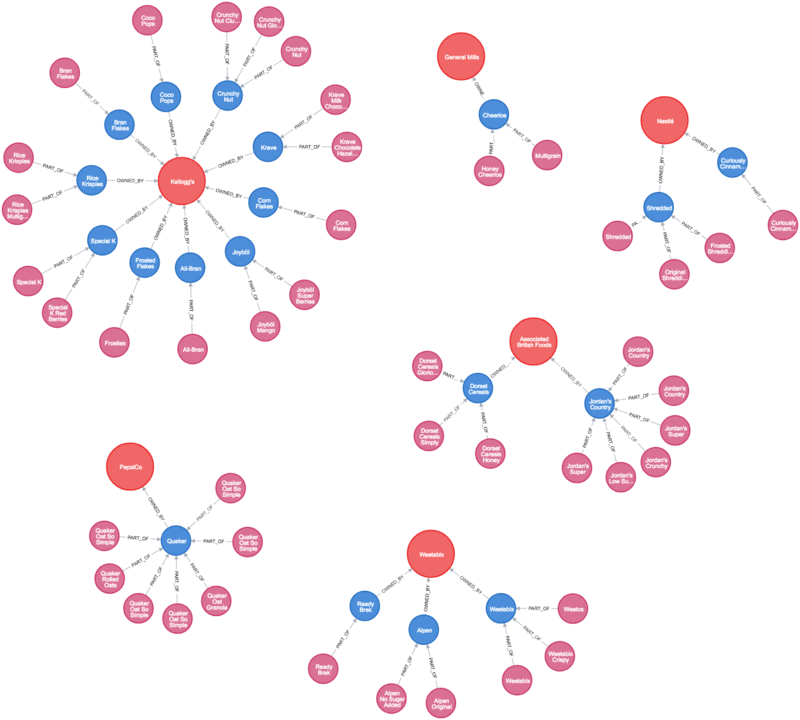 In the interest of trying to follow a “scientific” approach for adding more data to my graph, I went on a reconnaissance mission, visiting two grocery stores nearest to the Neo4j London office – Tesco Express and Sainsbury’s Local. The goal was to see just how many products came from the 10 aforementioned companies. You can see a few more company nodes in these graphs than were included in our original infographic. I noticed cereals for sale from Weetabix and Associated British Foods, so I included those brands and companies in the graph for completeness. There’s a pretty sizeable overlap in the cereal offerings at each store, with only a few available in one store only. Honestly, that’s not as drastic as I was expecting! Two-thirds of the cereals for sale at these nearby grocery stores are from the 10 companies in our original infographic, and one-third are from other companies. Of course, this was only a small bit of personal research, and I might get different numbers from a larger grocery store (or by combining results from many stores around the world). Still, a very interesting result! One more thing: While doing my research for this blog post I gathered some documentation about each of the 10 companies from our original infographic. [IMAGE 8] This is just a small sample of the information available on the web for each of these companies – a link to the sustainability pages on each of their websites, a link to their Glassdoor review page, and some random news articles plucked from Google search results. My thinking was that – as a consumer, standing there in the grocery aisle trying to decide which product to buy – it might be nice to know a bit more about the companies making these products. Do they pay a reasonable amount of corporate taxes in the country you live in? Do they support diversity in their work force, even to the very top of their organization? Are they working to support fair trade commerce or reduce plastic pollution? Everyone has issues that they care about most, and being able to spend your money with companies whose values align with yours can be a very good feeling! 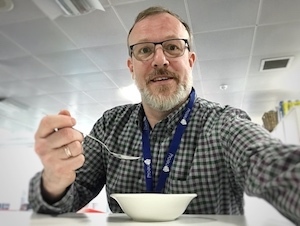 Anyway, all of this research has made me hungry – and has also made me realize how much I miss sugary American cereal. You can’t find Peanut Butter Cap’n Crunch anywhere in the UK, I’ve tried. So I’m off to crunch my way through a bowl of something right now. Until next time, happy shopping! Like my previous post, this is another example of a knowledge graph – except this time, instead of mapping knowledge about tea we’re mapping knowledge about products, brands and the companies that own them. This is a similar concept to “ultimate beneficial ownership,” a term often used in the financial services industry to indicate a person or company which is the “ultimate beneficiary” of another company through potentially complicated ownership structures and financial transaction patterns. 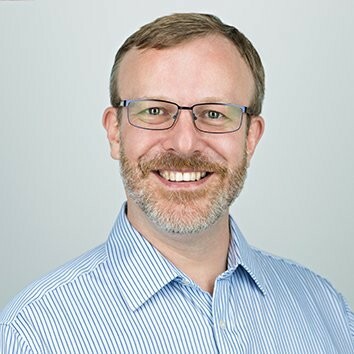 Originally from the USA but now living in the UK, Joe Depeau has over 20 years of varied experience in the IT industry across a number of domains and specialties. Most recently, Joe has focused on technical pre-sales and solution architecture in the data and analytics space. When not geeking out over data and technology he enjoys camping, tending to his garden allotment, reading, and playing boardgames and RPGs. He also bakes a mean cheesecake.